We specialize in fast turn-around, custom designed OSHA and ADA signs for commercial clients who need specific solutions to existing problems. 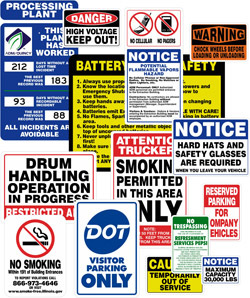 All too often, the Plant Manager or Safety Director feels as if he or she must modify their company's rules to fit the wording available from mail order sign catalogs. We produce signs with the exact wording you need to inform, regulate, guide or enforce specific rules, policies or directions. A variety of substrate materials in a large array of sizes are readily available including varying weights of aluminum, corrugated plastic and PVC. Most low volume standard sized orders of 10 signs or less will ship within 48 hours. Contact us today and find out how quickly your specific need can be addressed.